Surya Laxmi Industries having plain and printed range of U Cut Non Woven Bags and Printed Non Woven U Cut Bags. 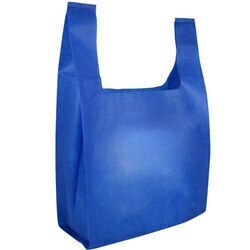 These bags look like a polythene but it can carry good amount of weight and being adopted by main general stores and we are the big manufacturer today in making and printing Elight Brand U Cut Color Non Woven Bags and U cut White Lower GSM Non Woven Bags. Nobody can deny the fact that today packaging industry has been constantly changing and becoming one among top industries because today everybody required to package their product in a nice carry bag and marketers got to know that if they want to attract eye balls so they have to focus on packaging and labeling. Contact for U Cut Non Woven Bags In Delhi Ncr Printed U Cut Non Woven Bags In Delhi Manufacturer Of U Cut Non Woven Bags In Delhi Gurgaon U cut Printed Non Woven Bags In Delhi Ncr India.